Love this masque! It smells amazing and feels great on. It makes my hair silky. Love all your product!! This conditioning mask for thick hair has worked great for my normal-ish thin hair. It is not just for thick hair. It has left my hair feeling softer and so moisturized it is unbelievable. I know the price can throw you off but I can guarantee you it is worth every penny. I would definitely recommend anyone looking for a conditioning mask to nourish and detangle frizzy hair. I am one of those girls that have to blow dry and straighten my hair everyday so I’m constantly worried about damaging it. This mask has took all of those worries away. I started out using it every 3 or 4 days but now I only have to use it once a week. My favorite hair mask! Smells great and really nourishes my hair without weighing it down. It gives me bouncy, soft and shiny hair!! Love it!! I use this masque as my after shampoo conditioner every time I shampoo. I love it!!! It has made my frizzy thick hair silky. I recently let my hair go grey & this conditioner has helped that process. I not have the rough frizziness that I worried about. I just squeeze my hair, run the conditioner through it & in the time it takes to wash & rinse my hair is conditioned & beautiful!! This is product is so worth it!! It’s completely different from every other similar mask I’ve tried – it smells heavenly and really works wonders on my hair. I got it as a sample and ordered the full size after one use. I’m halfway through the full size. I leave the mask on for about 10 minutes and when I rinse it off and blow-dry I can see the result right away. My hair is extremely smooth, shiny, not to mention smells great. If you’re gonna splurge on something for your hair – splurge on this mask! I love this masque! It makes my thick dry hair soft and silky. Plus it smells amazing! I love this masque, it tames my dry curly hair. I have been looking for a product that would detangle my hair so that when I run my wide tooth comb through it, my hair would not be ripped out of my head. This masque protects my hair against something like that from happening. It also so good which is a plus! This conditioning mask is excellent. I have thick dry natural hair, and this treatment makes my hair soft and manageable. I use this mask before a blow out and my hair looks perfect every time. Love it!! I use this after I get my highlights to give my hair some extra TLC.The scent is divine and it leaves hair luxuriously soft. I have thick, long, wavy hair and it detangles well and gets rid of any frizziness. 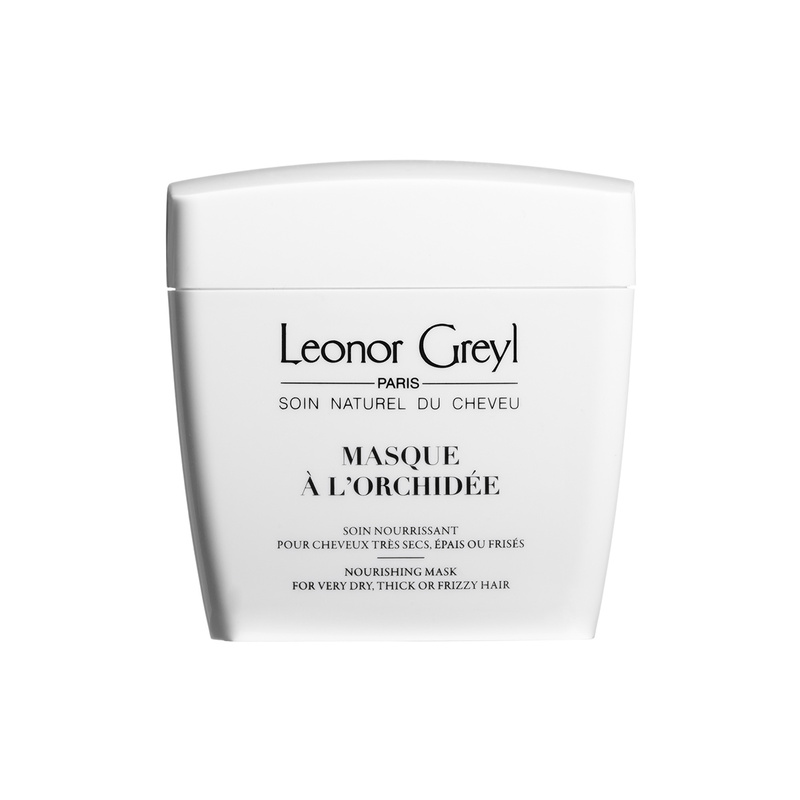 I love this masque and other products from Leonor Greyl. My hair has never been healthier. I no longer have to use styling products for frizz because my hair is so smooth and soft. I absolutely love this hair masque. I have very fine, very curly hair! This mask conditions without weighing my hair down! I use it about 3-4 times per week in place of regular conditioner. It’s THE BEST! HAIR: thin, colored, fragile, dry, (bottom of) ear-length but oily SCALP with tendency toward itchiness and sore bumps called folliculitis by dermatologist and temporarily cured by antibiotic, yet also by antiviral. MASQUE MIXTURE: If I mix Fleurs de Jasmin and Masque Orchidee, I can get a combination that has both moisture and non-greasy oil conditioning. PROCEDURE: rub 1/8 tsp of each in palms of hands especially into ends of lightly towel-dried hair. Wait 5-10 min (timer). Brush teeth, shower. Then rinse with warm to cool water. STYLE using large round natural-bristle brush. Amazing treatment. I have long hair and this treatment works so well as it does not weigh my hair down. It gives great strength to the hair naturally without all the silicones. Smells wonderful which it a great added benefit to having healthy hair. I purchased the luxury sample set to test out this line. Very impressed! It is a day at the spa in a bag!The Orchidee Masque smells intoxicatingly gorgeous! Left my hair feeling soft and silky. I have curly, color-treated hair that is somewhat dry. This conditioning treatment, along with the pre-shampoo treatment oil, helps to maintain the color as well as moisturizing my hair. Highly recommend this mask. This product totally delivers for me! Although I have a love/hate relationship with my hair, mostly I love it. But when it’s hot out or really cold, my hair gets so dry and I get the FRIZZ! Then I hate my hair. Since I’ve been using this product, I’ve been super happy with the way it looks and feels. It’s easier to blow out (although I only make the effort once a week), and even seems easier to style in general. Love!! I was given this Leonor Greyl Orchid Mask as a gift and have to say that it has made a huge difference with my dry, thick, curly hair. I have used it as you normally would in the shower with shampoo, and have also applied it in conjunction LG’s Palm Oil on my dry hair by leaving them both on for an hour or more before heading to the shower. The orchid smell alone will put you in a good mood. When I researched the LG product line, I found out that their products are all silicone free which means my hair feels lighter and cleaner. I love this stuff! I’m a surfer, and the Huile de Palme Oil is a MUST for anyone that’s in the water as much as I am. It provides a barrier for my hair against the salt water, and prevents the dreadlock formation that normally occurs after a surf session. If I know a swell is coming, I also use the Orchidee Hair Mask at night (LOVE it) to prepare my hair for the hours in the water – this helps tremendously to fortify the hair cuticle! Thank you Leonor Greyl for the incredible products – I can’t live without them! It is another travel abroad that inspired this product in 1999. Upon returning from Mauritius, Jean-Marie Greyl researched the moisturizing and regenerating properties of orchid, a flower that wasn’t used in cosmetics at the time. To provide a solution for difficult-to-style dry or frizzy hair, he combined orchid extract and plant oils in a mask to boost suppleness and tame the most unruly hair. The ultimate softening mask, Masque à l’Orchidée can be used as a conditioner to make styling easier or as a deep treatment to nourish and repair hair.